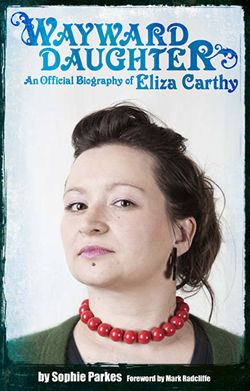 Wayward Daughter: An official biography of Eliza Carthy: Wayward Daughter launch - two weeks today! Wayward Daughter launch - two weeks today! If you're hoping to come along to The Greystones pub to hear Eliza Carthy play, along with some of her friends mentioned throughout the course of the book, including Jon Boden (probably best known as Bellowhead frontman) and Saul Rose, then please don't delay - tickets are flying! You can get them here. If you've already got your tickets, please make sure you arrive around 7pm ish, as we'll be getting underway promptly at 7.30pm - just because there's so much to cram in! Alongside the live music performances, which will also see a set from The Bar-steward Sons of Val Doonican, Eliza will be answering questions and signing copies of the book. Please note that this event will be predominantly standing - though there are a few seats around the edge of the room, most guests will need to stand.